When a close friend leaves us, sadness can remain. When a parent leaves us, the pain stays. The thought of being alone can be terrifying. Who can we count on? With whom can we share our heavy burdens? The disciples were truly shaken at the thought of Jesus leaving. I suppose you also would be very upset if you had the privilege of walking around with God in the flesh for three years. But Jesus didn’t seem worried. He knew his disciples would never be alone. Jesus promised that the Father would send another One - the Holy Spirit. He would be the exact same as Jesus, except he wouldn’t have skin on. This Holy Spirit would make sure that we didn’t live as orphans. He would reveal the Father’s heart of love to us. The Holy Spirit would also remind us of all Jesus’ words. He would be talking a lot! You have a promise from God that you will never be alone. But you might feel quite alone at times. Even in a crowd, you might feel like no one truly understands you. How well do you know the Holy Spirit? The Holy Spirit is constantly speaking, moving, reminding, loving, convicting and encouraging. But, are you listening? The more you learn to hear his voice and notice his movements, the more you will sense security flooding your soul. 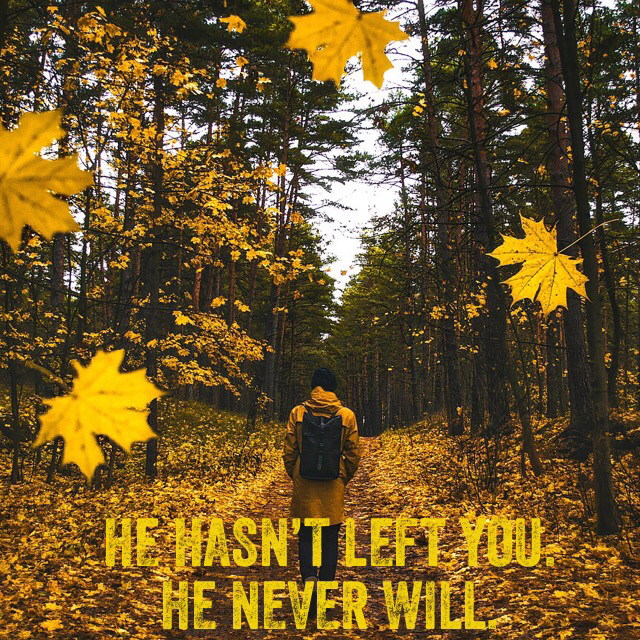 He says, “I will never leave you or forsake you” (Hebrews 13:5). This is his promise based on his own faithfulness, not your present attractiveness. He’s not going anywhere. You’re stuck with him. And that’s a good thing!